SKYLIFT is a superior heavy duty platform lift that uniquely provides a “clear floor” concept for the user with a true, vertical rise. The product’s elegant design includes two independent runways, vertical lifting, no crossbeams, no overhang and no base frame. The SKYLIFT provides free access from all sides with easy installation and minimal maintenance.” The lift’s modular design allows for flush mounted or surface mounted installation and permits various lengths to be incorporated in a single lift. See recent article in Modern Work Truck Solutions - "Lift with Care"
Tandem configuration, up to 100 ft. in length with capacity of 156,000 lbs. Lifting capacity 62,400 lbs. 78,000 lbs. No overhang, no crossbeams, no base frame and four independent support legs; providing optimal working space for the mechanic in and around the lift and leaving more workspace over. 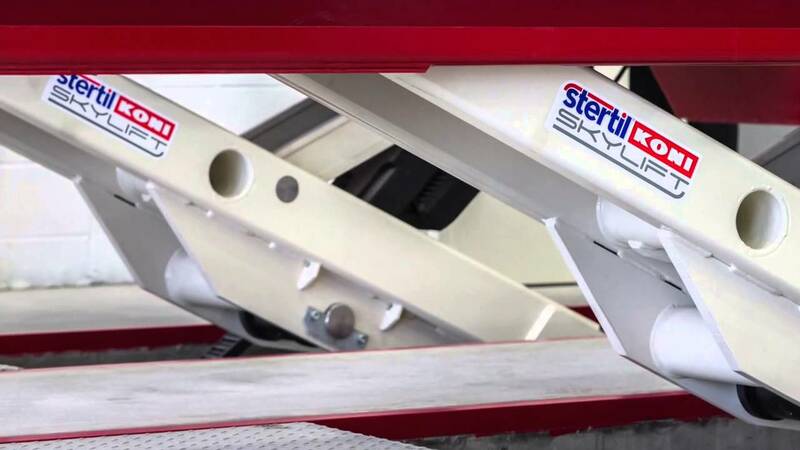 The Stertil-Koni platform lift has an innovative Y-shaped construction which makes it both robust and at the same time stream-lined for optimum space-saving. The clever patented design means that the supporting base plates effectively divert the forces and this with a lightweight construction. The SKYLIFT Surface Mounted model can be installed without any special construction preparations. The open floor makes the mechanic's job simpler, safer, and more efficient. The SKYLIFT Semi-Flush hybrid model has an extremely low drive-on height of just 10.25" thanks to the 3.5" recesses of all four of the lift supports. The SKYLIFT Flush Mounted model offers obstacle-free access. The drive-on platforms are flush with the workshop floor, ideal for low clearance vehicles. The lifting height remains the same 69". An automatic recess cover plate system is available to maintain a clear working space. The SKYLIFT Wash Bay is water resistant for wash bay, steam cleaning, or outdoor installations. Supplied with fully hot-dip galvanized platforms, anti-corrosion coating, and a sealed stainless steel control panel, the Wash Bay is the most rugged SKYLIFT. The SKYLIFT platform lift is available in a variety of models suitable for not only a wide range of vehicles but also for a wide range of workshop situations. Do you have an existing workshop and do not want to renovate. Consider the surface-mounted SKYLIFT, requiring no pit construction. For renovations or new workshops, consider the SKYLIFT flush mounted version and semi-flush hybrid version. The SKYLIFT Wash Bay version is ideal for harsh outdoor installations. Water-resistant, anti-corrosion, hot-dipped galvanised steel platforms and a sealed bay come standard on this rugged version. Take a look at the features of all versions shown above. Special aluminum anti-slip plates are available for installation on the platforms. Stertil-Koni also developed a tough new Stertil Guard Anti-Skid 3-component epoxy topcoat for superior grip and abrasion resistanct. Both methos guarantee a perfect anti-slip effect and keep your platforms in better condition for longer. All SKYLIFT platform lifts have an individual measuring system. As a result, the synchronization of the lift in continuously monitored and minor corrections made where necessary. The reliable and robust hydraulic lifting system requires virtually no maintenace. The SKYLIFT has enough head space to work comfortably underneath the lift with a generous vehicle lifting height of 69". Additionally, there is a programmable height for every installation. The SKYLIFT flush-mounted version is available recess cover plates which automatically raise with the lift to fill the recesses - no gaps are left on the floor. The clear floor space and overhead height makes your mechanic's job safer, faster, and gets your vehicle off the lift and back on the road. The SKYLIFT Surface Mount requires only 16 installation anchors in your floor. You can keep your workshop open while installing a new SKYLIFT, further maximizing your shop's productivity.